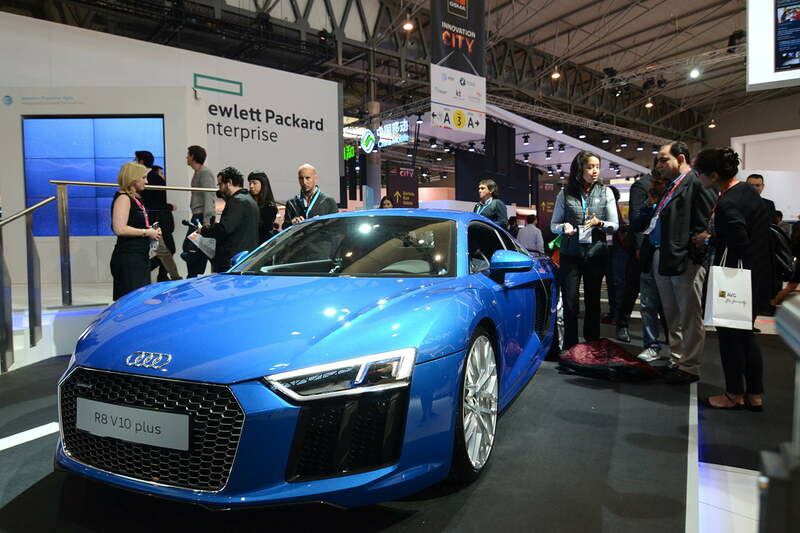 While most of the big press conferences that kicked off the show were on Sunday, Mobile World Congress 2016 officially opened its doors on Monday — and the air was electric with excitement. Of course, that might have been from the body heat — 101,000 people packed their way into the Fira Gran Via and Fira Montjuic in Barcelona, 7,000 more people than last year. Of that record-breaking number, though, only 3,600 were members of the international press and media. 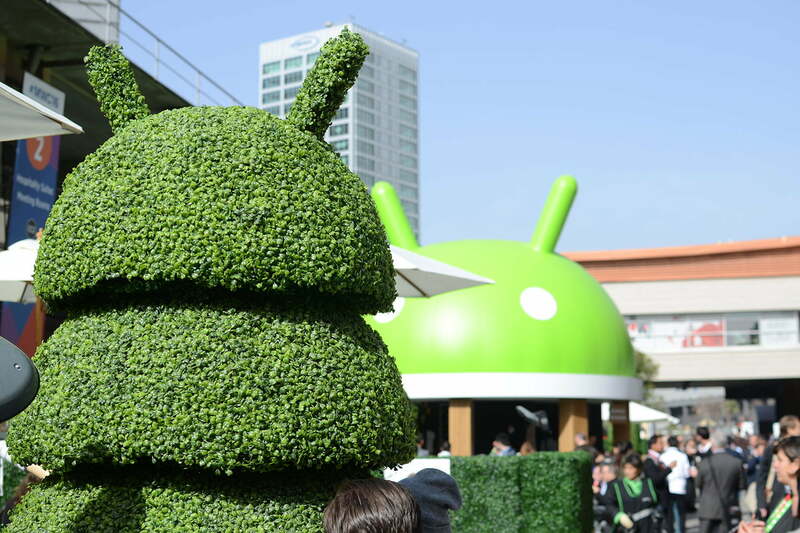 And just like every year, we saw all the big players making announcements and retaining a major presence at the show, including Samsung, LG, Huawei, Qualcomm, Google, Intel, and HTC, to name a few. Some of their booths had interactive demos of products, while others relied on a more traditional approach of simply displaying their new tech, like ZTE. 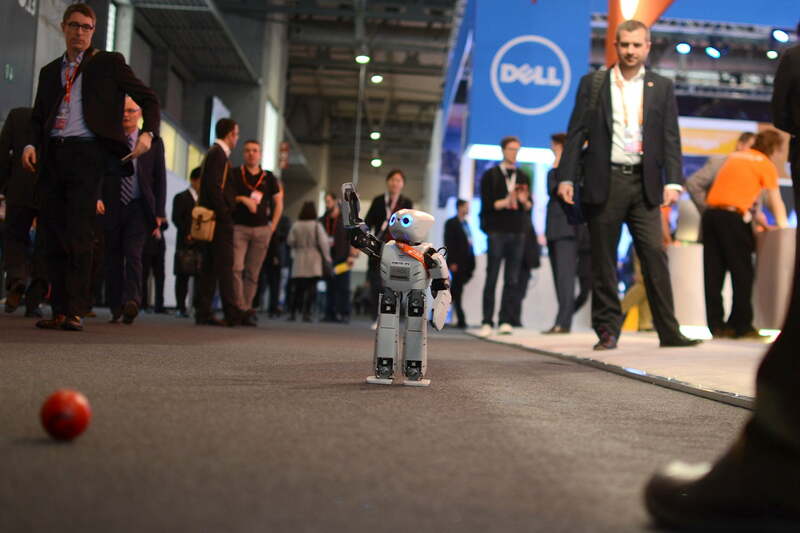 They’re not taking over the world just yet, but robots had a pretty big presence at MWC this year. This began with LG’s announcement of the Rolling Bot, a ball-shaped robot that monitors your home when you’re away, and even lets you play with your pet with a laser that you can operate from a remote location. For more humanoid bots, you’d best look toward Pepper, by Aldebaran, which can detect human emotions. Pepper will soon be outfitted with IBM’s Watson technology, making the bot all the more responsive. The robot pictured here is one that’s already powered by Watson. Take a look at our round-up of some of the best robots we saw at the show. 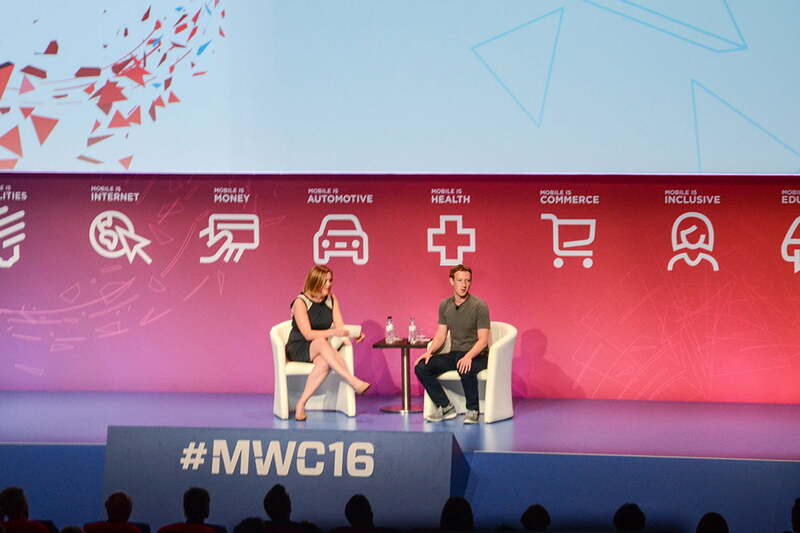 Facebook’s Mark Zuckerberg made an appearance twice this year — once at Samsung’s Unpacked event to talk about virtual reality, and the second time as the keynote speaker for the show toward the end of the first day. “Zuck” was trending on Twitter during the keynote, as the CEO discussed bringing connectivity across the world, presented his thoughts on the Apple vs. FBI case, and described his personal aspirations to build a Jarvis-like artificial intelligence for his home. 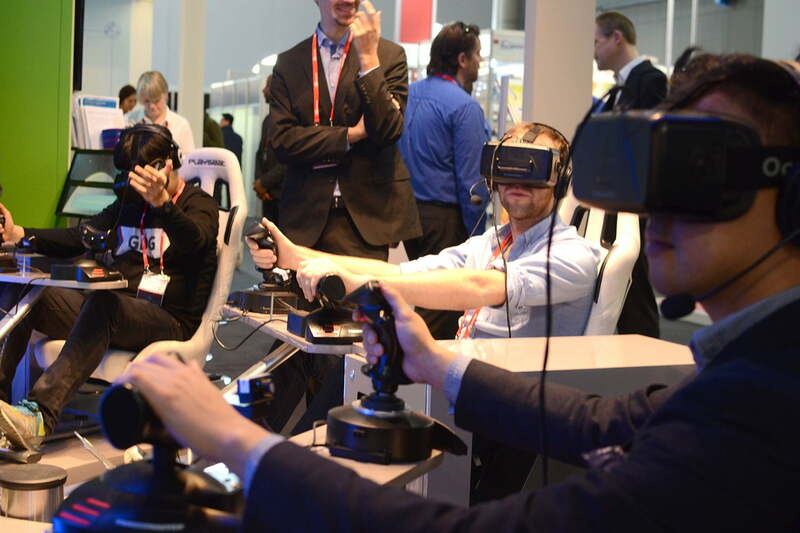 Robots were big, but virtual reality kept the masses entertained. Nearly every hall had some form of a “VR experience” or demo for people to try, the most popular being the highly appraised HTC Vive. The one pictured is a demo by the Institute of Electric and Electronics Engineers for a collaborative VR Mars rover mini-game, and showcases the multiplayer use-cases of VR games. Since only 3,600 of the 101,000 participants were journalists — who made up the rest? 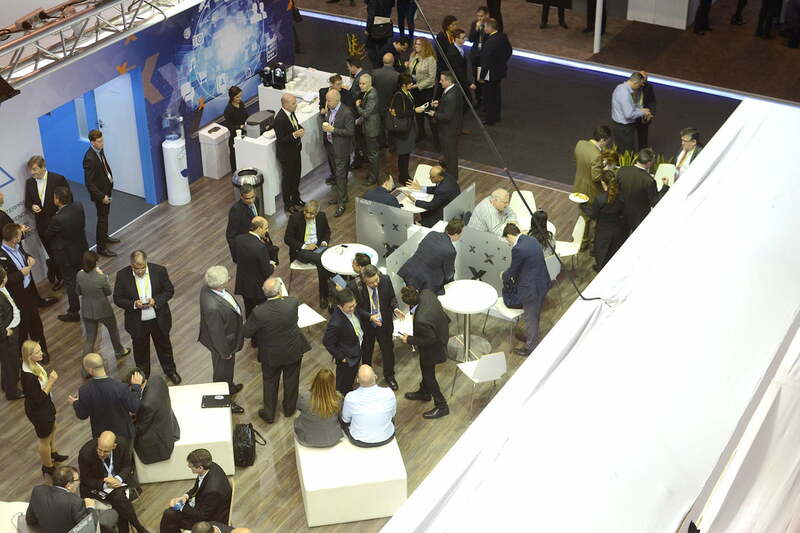 Analysts, company employees, exhibitors, GSMA members — there was no shortage of meeting rooms that were closed off to press, offering private spaces for industry members to converse. And what kind of a show would it be if it smartphones weren’t the highlight? Arguably two of the most anticipated phones of the past year made their debuts at the show – the LG G5 and the Samsung Galaxy S7 and S7 Edge made headlines and caused long queues to form for people trying to get a glimpse of the two hottest phones at the moment. 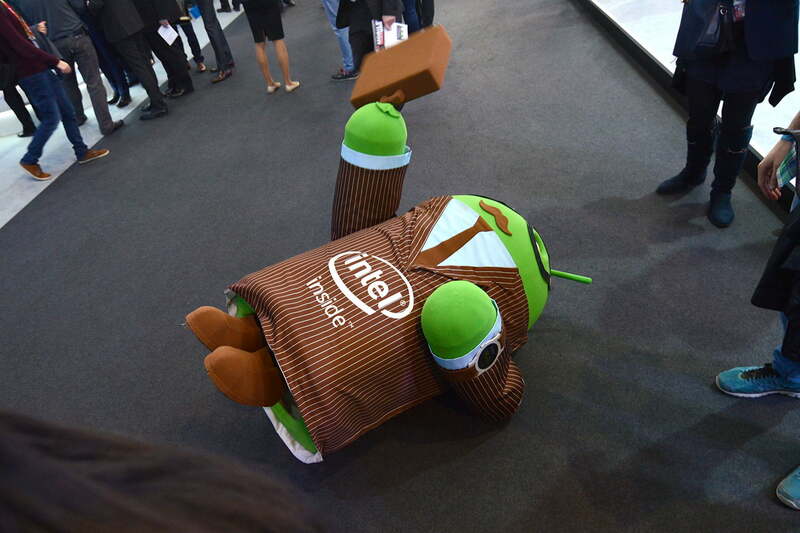 Of course, they were hardly the only flagship phones generating interest. 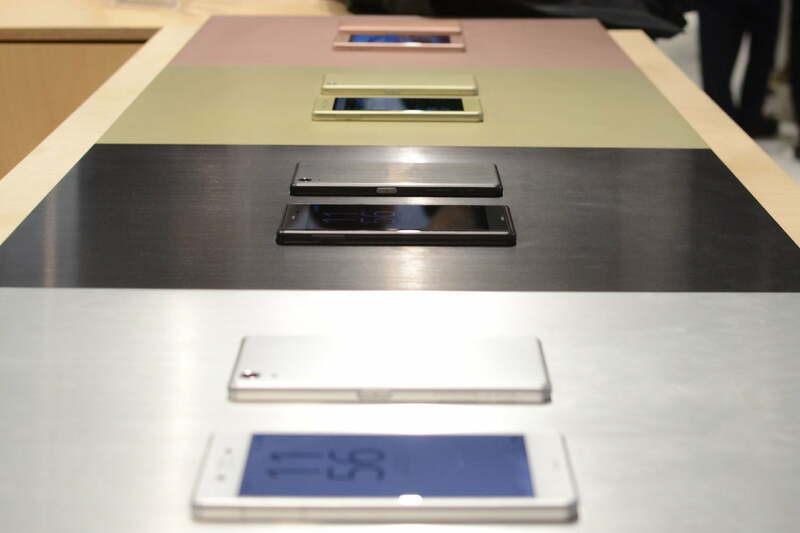 Xiaomi finally announced the Mi5, and Sony had the Xperia X. And let’s not forget the myriad of mid-range-to-budget devices that were also showcased throughout the show, from startups like French-company Wiko, to a new Android One device from General Mobile. 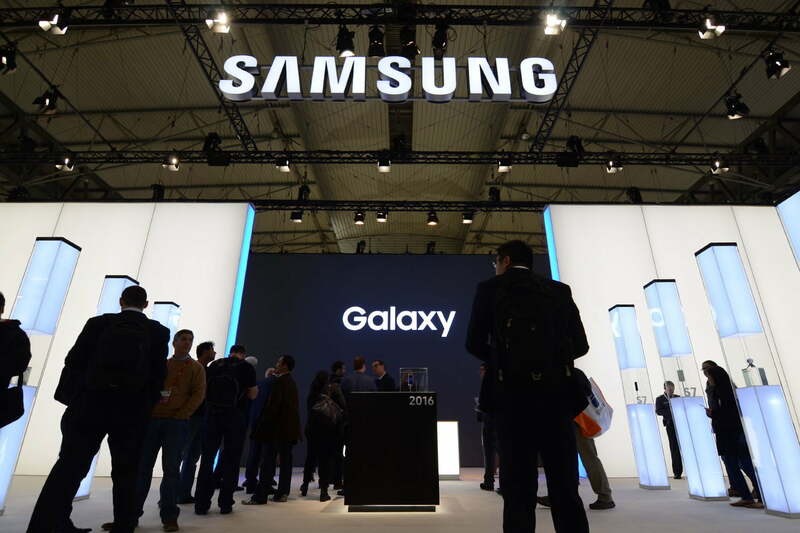 The Korean company brought to the show its Museum of Innovation, which offered a historical account of Samsung’s devices, ranging from Samsung’s first mobile phone in 1988, the SH-100 — a behemoth of a device, to its first smartwatch, the 2013 Galaxy Gear. It all naturally led up to 2016, marking the debut of the highly anticipated Galaxy S7 and S7 Edge. Qualcomm also brought its own museum to the show — though it wasn’t too hard to carry. 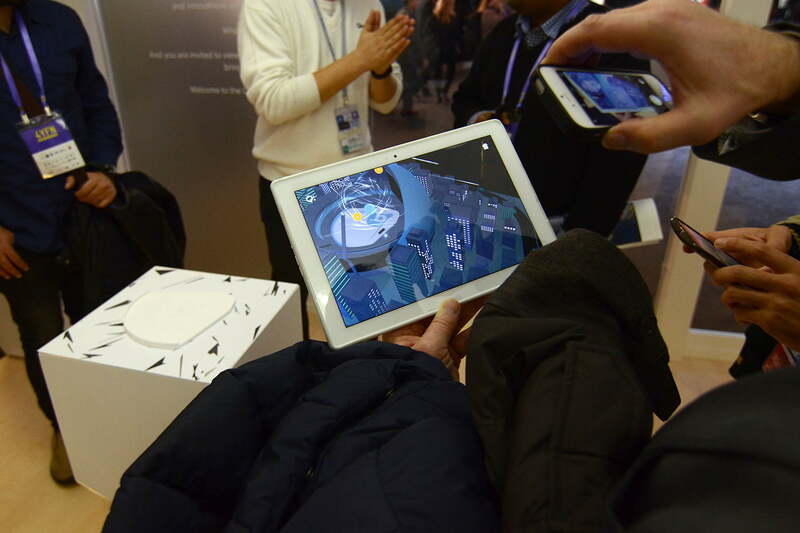 The Invisible Museum featured several set pieces that looked quite plain — until you bring up a tablet powered by Qualcomm’s Snapdragon 820. The piece lights up and displays several themes — one of which is the smart city. It depicts smart trash collection, smart buildings, phone booths turned into Wi-Fi hubs, and a whole lot more — all as seen through a tablet pointed at a single, plain-looking skyscraper. 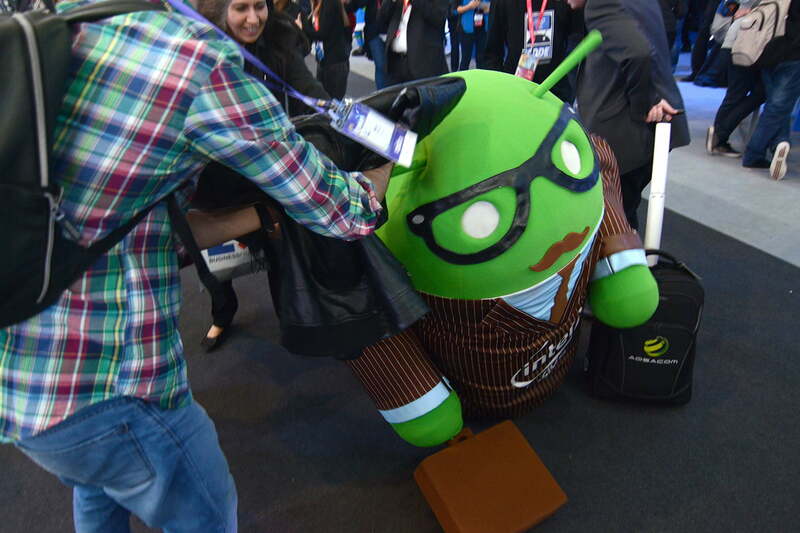 …But don’t worry — he got the help he needed to get up and continue taking photos with people, spreading the Android spirit around. It may be easy to forget in the heat of the show, but the set designs for a lot of booths were downright incredible. 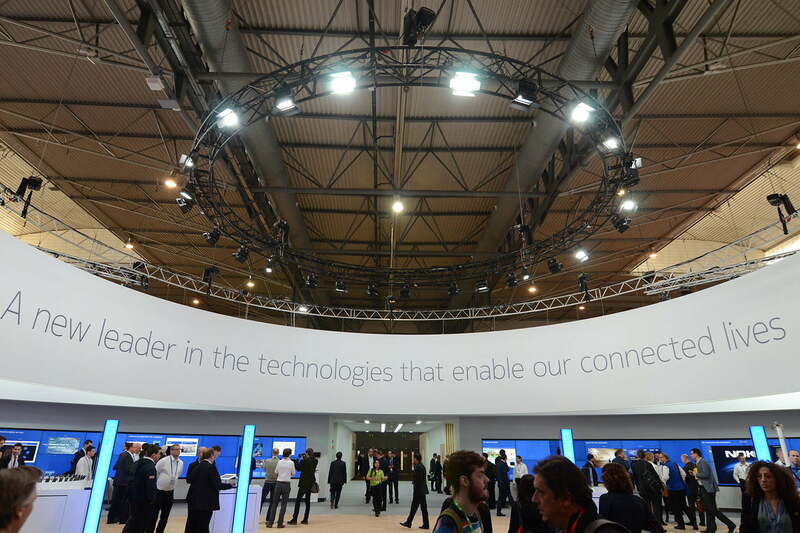 Pictured above is Nokia’s, but other notable mentions include Intel’s booth, which had floating rings above it lighting its space. Samsung had another incredible enclosed space, covered in white light and glass cases that protected its devices from grabby hands. ZTE was white and minimalistic as well, but HTC also did a great job in showcasing people demoing the Vive with outward facing enclosures. It stopped people in their tracks and made them line up to try it themselves. 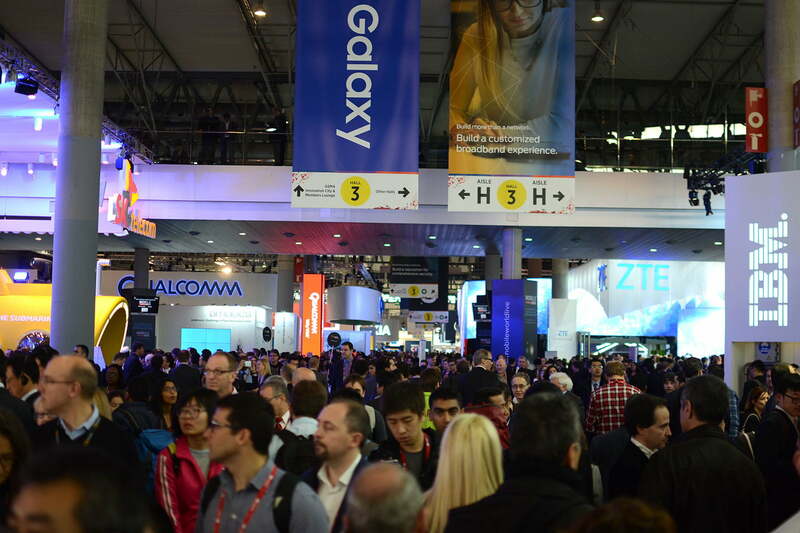 It has become normal to expect GSMA’s Innovation City to be present at Mobile World Congress, but 2016’s version felt quite small compared to years past. This year’s highlight was most likely the Starship, a semi-autonomous robot that will make its first delivery in April. The company was formed by the co-founders of Skype, and is seeking to have this six-wheeled rover replace your delivery man. Smartwatches took a bit of a backseat this year at MWC, especially compared to last month’s CES, where we saw a nearly endless supply of new fitness trackers. There were a handful of interesting devices — notably FlexEnable’s curved bangle, that showed off its plastic, organic LCD screen. 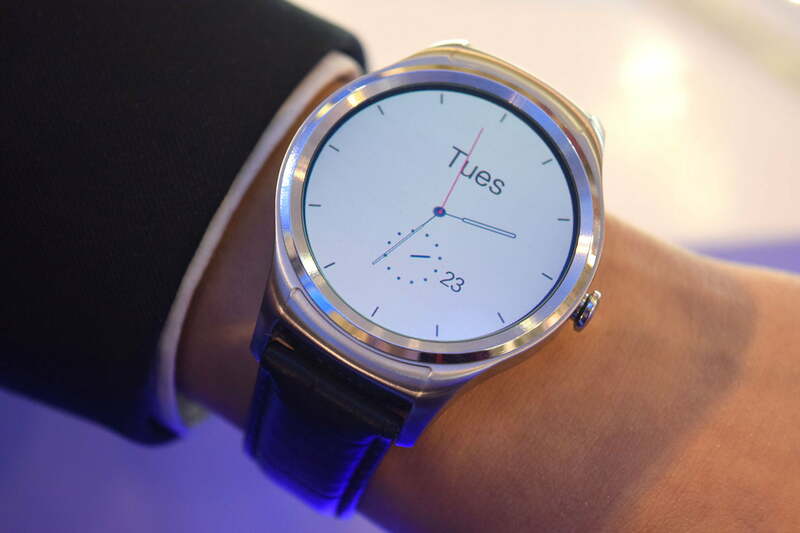 Haier also had a neat-looking Android smartwatch (not Android Wear), that had Haier’s own customized UI over it, which is the one pictured above.